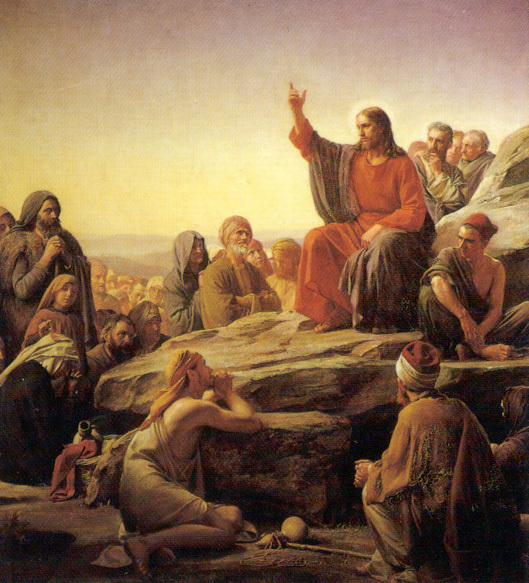 In each instance, the Savior taught the law as outlined in the Old Testament. “It hath been said”, was his way of emphasizing the law the Jews were used to. He then followed up with an explanation that He came to bring us to a higher plane, a way of thinking that deals more with our motives, thoughts, and feelings than our overt actions. This is the principle that I emphasized in class: it is our motives that define us. Our motives drive us. The more we examine why we do what we do, the more healthy we become, the more we are able to have the influence of Heaven upon us. Jesus isn’t so much after our proper actions as He is after our hearts. Once He has our hearts, the rest will fall in line. With respect to adultery, Jesus was saying that we need to have our hearts in line with Him. Not lusting “in our heart” is the rule that keeps an individual from breaking the Law of Chastity. To be a Saint requires our hearts and souls. In the times of Jesus, worldly people begun to take advantage of the divorce laws in their culture. Though marriage had been established in the beginning as a religions institution, a rite intended to bind the participants forever, yet in the times of Moses divorce had been permitted “because of the hardness” of the hearts of the people (see Matthew 19:3-8). By the time of Christ the situation had gotten much worse. Given his understanding of life among the Palestinian Jews in His day, one can appreciate why the Savior would desire the reform of a system that allowed men to slip easily in and out of marriage. Jesus gave a call to a higher standard of righteousness, an invitation to consider carefully the sacred nature of marriage and the importance of fidelity and commitment between married partners. This is something that the world we live in today could be reminded of! We spent time in class talking about redemptive honesty. We looked at the ideas presented by Wallace Goddard in an article entitled, “Honest Lies and Shaded Truths“. 3 The idea is essentially that just because something is true, it does not necessarily mean that we should say it. Yet there are times when speaking the truth (even though it may hurt someone) is in the best interest of all the parties involved. It all comes down to our motives. This to me, is the theme that underlies the Sermon on the Mount. Jesus is asking that we look inside ourselves and examine why we do what we do. I believe that when we examine what the scriptures teach about resistance to evil, that the Savior does not teach that we should lie down and take it. Certainly there are times in the scriptures when the righteous are abused and do take it. In Matthew 5, Jesus is addressing a group of people who have been subject to Rome. They have at times been abused, and there must have existed a group among His hearers who felt that they should do something about their treatment. The Greek word translated as “resist” in Matthew 5:39, “resist not evil” is antistenai, meaning literally to stand (stenai) against (anti). This translation, “resist,” creates the impression that only two alternatives exist, resistance and nonresistance. Since Jesus clearly forbids resistance, nonresistance alone remains. What this has frequently meant in practice is passivity, withdrawal, submissiveness in the face of evil, an unwillingness to stand up for one’s rights or the rights of others, and supine cowardice. What some translators have overlooked is that antistenai is most often used in the Greek version of the Old Testament as a technical term for warfare (44 out of 71 times). “Stand against” referred to the practice of marching one’s army up against the opponent’s until the two fell upon each other in battle. The same usage characterizes Josephus’ use of the word (15 out of 17 times). Ephesians 6:13 reflects this idea: “Wherefore take unto you the whole armour of God, that ye may be able to withstand (antistenai) in the evil day, and having done all, to stand (stenai).” This idea in this verse illustrates not a war of attrition, where two sides beat each other up endlessly, but rather is an image of one standing his ground, not yielding to sin. Jesus is not telling us to give in to evil, but rather to refuse to oppose evil on its own terms. He is urging us to avoid mirroring evil, to refuse to let the opponent dictate the methods of our opposition. Another way to read the intent of Matthew 5:39 is to not repay evil with evil. Readers generally imagine this as a blow with the right fist. But such a blow would fall on the left cheek. To hit the right cheek with a fist would require the left hand. But the left hand was reserved only for unclean tasks; at Qumran, even to gesture with the left hand meant exclusion from the meeting and penance for ten days. The only conceivable blow is a right-handed backhand. The backhand was not a blow to injure, but to insult, humiliate, degrade. It was not administered to an equal, but to an inferior. Masters backhanded slaves; husbands, wives; parents, children; Romans, Jews. The whole point of the blow was to force someone who was out of line back into his or her normal social station. Notice Jesus’ audience: “If anyone strikes you.” These are people used to being degraded. He is saying to them, “Refuse to accept this kind of treatment anymore. If they backhand you, turn the other cheek.” By turning the cheek, the servant makes it impossible for the master to use the backhand again. The left cheek now offers a perfect target for a blow with the right fist; but only equals have fistfights, and the last thing the master wishes to do is to establish this underling’s equality. Logistically, the superior is deprived of any way to make his point. The servant has irrevocably conveyed the message: I am not a “thing,” I am a human being, and nothing you can do from now on can deprive me of that status. I refuse to be humiliated any longer. I am your equal. I am a child of God. There are several illustrations of this idea taught in scripture and found in history. We have the examples of the midwives in the Exodus account. The defied evil, but not with evil. They saved the lives of innocent babies in defiance of the evil dictates of the Pharoah. Another example of refusing to oppose evil on its own terms comes from the story of the people of Alma during their subjection to Amulon. When they were told that they were not allowed to pray, they continued to pray in their hearts. They defied Amulon in a way that was nonviolent. I like the term nonviolent civil resistance. “Nonviolence is a powerful and just weapon, which cuts without wounding and ennobles the man who wields it. 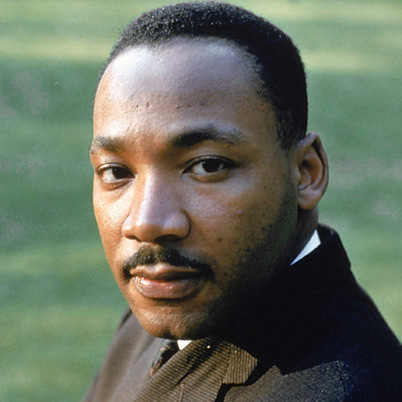 It is a sword that heals.” – Martin Luther King, Jr.
Two examples from history that youth are familiar with are Dr. Martin Luther King and Gandhi. Both of these great men were able to resist evil, but in nonviolent and civil ways. I believe that these two individuals are excellent examples of what it means to “turn the other cheek.” There have been times when I have heard this verse to mean that wives should be subject to the violent outbursts of their husbands. I disagree with this interpretation, in fact, I take this verse to mean that a battered woman should meet this evil in a nonviolent, civil way. A way whereby the husband has his ability to abuse his wife revoked. She should refuse meet evil on its own terms, nevertheless, she should oppose it with all the power in her possession. The command to “love your enemies,” (Matthew 5:44) is one of the greatest tests of our discipleship. To show forth an increase of love to those who annoy, abuse or otherwise oppose us is incredibly difficult. Yet this is what will bring us more in line with the character of Jesus Christ. We spent time in class talking about difficult relationships and what we can do to improve them. Each class had different challenges. This topic comes up again when we discuss the Good Samaritan. It is so easy to love those who we get along with. It is those that make life difficult that test our Christianity. I suppose Lehi learned more from his dealings with Laman and Lemuel than he did with Nephi and Sam. 1. Bruce R. McConkie, Mortal Messiah 2:139; see also 3:291-96; Doctrinal New Testament Commentary 1:546-48. 2. Elaine Pagels, Adam, Eve, and the Serpent, pp. 13-14. 3. Wallace Goddard, Honest Lies and Shaded Truths, Meridian Magazine, April 27, 2009. 4. Walter Wink, Engaging the Powers, Minneapolis: Fortress Press, 1992. See also Daniel K. Judd, Taking Sides: Clashing Views on Controversial Issues in Religion, p. 287. This entry was posted in Happiness, Jesus Christ, Leadership, New Testament, Principles and tagged applying the scriptures, Happiness, Jesus Christ, LDS seminary, LDS youth, Leadership, likening the scriptures, seminary relevance, seminary teaching ideas. Bookmark the permalink. Thank you. This is what I needed to hear. I stumbled upon this through total inspiration. Keep at it.